It was approaching midnight in Amsterdam. The vast sea of humanity flooding through the city’s narrow cobblestone roads had long since ebbed away, save for the seven shadowy figures straying beneath the dim street lamps lighting the way toward the Maloe Melo, a Dutch blues bar rumoured to exist along a canal on the Lijnbaansgracht. “Are we anywhere near the red light district?” asked Joe Rockman, bassist of the Jeff Healey Band, who had performed before a packed house at the Paradiso, only a few hours earlier. Everyone looked at each other, exchanging puzzled expressions. During his lifetime a lot of writers expended oceans worth of ink describing Jeff Healey as the prodigious guitarist who played without the benefit of sight. Lost in so many of these profiles was the fathomless scope of the man’s vision. If you’re reading this, chances are that you’ve already made a personal connection with Jeff Healey through his music. In literal terms, no other guitarist in history played the guitar like him — placing it square across his lap and playing it with both hands; he could wring notes from the instrument that other guitarists couldn’t even begin to imagine. And he drew from a bottomless well of influences: though known mainly for his blues and rock influences, Jeff knew enough about country music to fill the Grand Ole Opry, blew a mean trumpet and derived endless pleasure from listening to his collection of vintage 78 rpm jazz records – he literally owned thousands of them. How many people could simply run their fingertips along the grooves of a record and tell you, without looking: what song it was? Who performed it? Who wrote it? Who produced it? What label it was on? And what year it was released? 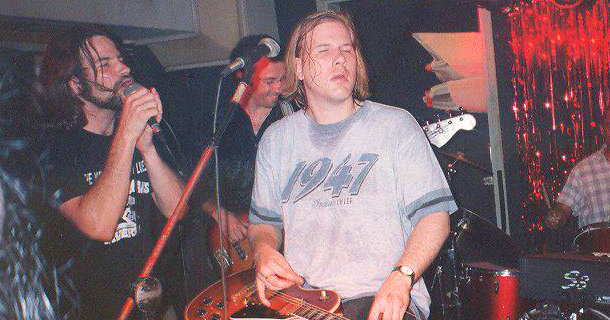 I’d first witnessed the power of Jeff Healey at the Cineplex, in the movie Road House: for me, he stole the film, portraying a modern day rock and roll Tiresias (the blind prophet of Greek myth) warning Patrick Swayze’s warrior bouncer of potential peril before leading the house band through his buzz saw renditions of classic blues numbers. Not long afterward, in 1989, my friend Paul Love and I saw the Jeff Healey Band perform at the Ontario Place Forum. From the back of the bandstand, I witnessed a homecoming gig that saw Jeff riding high, playing every possible combination of riffs and notes out of that guitar you could ever envision: conjuring up the heavy blues spirit of Jimi Hendrix in one moment, the deft and soulful touch of B.B. King in the next. “If I have one musical wish in my life” I said to myself, by way of prayer, “it’s that, just once, I want to get onstage and belt out a song with Jeff Healey”. Fade out on 1989; fade in on the Maloe Melo, Amsterdam’s “Home of the Blus”, that summer evening in 1998. Returning from the front bar with a pint of Guinness, I took a seat at the table the party had procured in the back room (where the club’s intimate postage stamp-sized stage was located) only to discover that Jeff and Joe’s seats happened to be empty. “How could I lose track of them in such a tiny club?” I wondered. Phillip Smith immediately picked up on my puzzled expression, pointing toward the stage – I could see Jeff sitting behind the drum kit, Joe Rockman cradling a bass beside him. In 1994, only a few weeks after moving to Toronto, I was assisting Conan Tobias — production manager of the Varsity, the University of Toronto’s student newspaper — when I noticed a copy of the Jeff Healey Band’s fan club newsletter sitting on his desk. Conan informed me that he worked for the band, said that he was in charge of the newsletter. A few weeks later, he invited me out their concert, introduced me to everyone backstage. (Coincidentally, Conan’s aunt had lived above my mother — in a tiny Oshawa apartment — shortly after I was born). Around this same time, the Jeff Healey Band announced that they’d signed on to manage Lilith, a young band from Oshawa featuring Colin Crawford (bassist) and Lonny Knapp (guitar). I’d met Colin and Lonny a few summers prior, had played baseball with them one afternoon when they were in a band with Kevin Komatsu, a drummer and close friend of mine. By the summer of 1998, after an ill-fated relationship had imploded, I sold everything I owned and left Canada to travel Europe. The plan was that there’d be no plan: I’d survive out there by hustling gigs in local bars and cafés, by playing my acoustic guitar and singing in the streets. My friend Phillip Smith, a professional photographer who’d recently bid adieu to his own studio and had experienced many sea changes in his own life, joined me, embracing the insanity of the idea. Before I left for Amsterdam, Conan Tobias mentioned that the Jeff Healey Band would be touring Europe that summer – should Phillip and I find ourselves in the same city, I should contact him back in Toronto, he suggested, saying that he’d throw me on the guest list. By my third week in Amsterdam, I’d become so consumed with all of the cultural shifts that I’d all but forgotten about Conan’s invitation when a fellow traveler from New Zealand enthused to Phillip and I that the Jeff Healey Band were coming in to perform at the Paradiso the following Monday. “No,” Jeff said, matter-of-factly, explaining that he was tired, that he’d played guitar and sung at the Paradiso for over two hours, was enjoying his time bashing behind the kit and would drum for one or two more tunes. “You have to get up there and sing a song while Jeff is drumming!” encouraged Phillip. The band lurched into a twelve-bar freeform jam. Phillip listened impatiently while I explained that I couldn’t just jump onstage to inject myself into the jam — I’d ask Rory if I could sing when the song was finished. When the final chord resolved, I did just that, approaching Rory to see if I could get up to sing a number. As Rory and I discussed the logistics, Joe Rockman assisted Jeff out from behind the kit – his time onstage obviously over. As Joe Rockman led him offstage, Jeff turned toward me. “You’re going to sing, Jonah?” “Yes, Jeff,” I confirmed. “Or so I’ve been told”. “Would you mind if I played the guitar with you?” he asked. The call went out for a chair and a guitar. Within minutes, the owner of a Gibson Les Paul Custom proudly presented it to Jeff. “What are we playing?” asked Jeff, plugging it in. “Whipping Post! !” I hollered. Joe Rockman recklessly tore into the hypnotic bass intro of the Allman Brothers’ standard as I seized the microphone. Healey came screaming in after a few bars, combining all of the fire of Duane Allman and Dickey Betts harmonized guitars in one breath, alternately pushing the rhythm and soaring through harmonized lead lines. Rory conjured up the spirit of Gregg Allman’s organ parts as the rest of the band soon entered the fray and I began to wail out lyrics about a man spurned as though my life depended on it (because it did!). Jeff’s fevered playing pitched the crowd into a complete frenzy – standing there beside him, it literally felt as though the stage was moving at an accelerated rate of speed, as though we were all standing in the cockpit of a jet about to launch skyward. After the song crashed to a close — after that blissfully brief heavy blues eternity — we all had a few drinks back at the table, talked and listened while Philip Sayce performed a set. Soon, we were joined by a Dutch airline pilot who sheepishly confessed that he’d always secretly longed to play electric blues guitar and would trade places with Jeff in a heartbeat – as I recall, Jeff asked if he could join him in the cockpit one day. Phillip and I hung out briefly with Jeff and Joe the next day, an off-day for the band, exchanging our accounts of the night before. Within a week, I joined a Dutch band named Guinnevere on a brief Irish tour. Almost fifteen years later, Jur, the owner of the Maloe Melo, posted pictures of the jam on to his Facebook account. Through the “magic” of the internet, the images were brought to the attention of Roger Costa, who now oversees this website celebrating the life of Jeff Healey. Even now, it’s difficult for me to refer to Jeff Healey in the past tense. He’s still here. His spirit lives on through his music. This man was so far ahead of his time that it will take the world decades to realize the supreme talent he possessed, not only as an artist and musician but as a man whose generosity of spirit elevated everyone around him. What a GR8 story. I thoroughly enjoyed it & must say I’m slightly jealous. My Jeff Healey story hardly compares but I’m gonna share it real quick anyway. Back somewhere in the mid to late 80’s a small group of friends & I went across the columbia river to spend the evening at the Rose festival on the waterfront in downtown Portland Or. I’d never heard of Jeff Healey until him & the band were introduced around 10p.m. or so. This was an outdoor venue & the sound quality was representative of this so my friends & I were standing a good 100 ft. away from center stage at the back of the crowd when they first started playing. I’ve no clue what song they opened with, but whatever it was, it got my attention. At the end of the first song I Told my friend’s I had to get closer to see better & headed to the front of the crowd. I stood right in front of Jeff thoroughly amazed by the way he played the guitar. Coming from a musically inclined family & being born w/an ear for music I became absolutely mesmerized by every note he played, many of which I’d never heard before due to Jeff’s unique ability & style of play. We all got them to do 2 encores, the last of which was Jimi’s “All along the watchtower”. Jeff plaid what seemed like a 20min. solo to finish out the song, at the end of which he stomped his guitar to pieces. Although I’ve never personally met Jeff, but after that show & several mo’s of reading & listening to all all thing’s Jeff Healey, I began to feel like he was one of my close friend’s. Not because of being a fan, but because of the way both his personal story & GR8 music has, & still does, touch my soul. It’s a good thing I find all of his music to be timeless because, needless to say, I’m a lifelong fan. I’d probably seen 500+ live performances by that time in my life, & half again as much since, but it’s in the top 5 of them all & if not for the sound quality being that of an outdoor concert, it would be #1 by far. To this day, it’s the #1 performance I’ve ever seen, & probably always will be. Your right about 1 thing for sure. He truly does live on in every note of his music & as far as I’m concerned, he always will. THX again for the GR8 story & God Bless! Thank you, Brian and Trina. Not bad for a blind white boy! Amazing Story Jonah. I Love your writing, I could read more of this all day. Such an exciting story, I didn’t want it to end. Thanks so much for sharing your life experiences with us Darlin. Please post some more of your stories I really enjoy reading your Work. You my Friend are one very Multi talented young man. oh my god. .. memories. thank you jonah to bring them back. I was lucky to meet the guys in zurich after their concert in may 2000. we went to a piano bar in the old part of town where jeff performed a set at the piano. it was a magic night… I’m happy that I had the chance to meet jeff and joe two times more in switzerland. I will always remember this time and both of them as two really great men with big hearts! This evening you describe sounds incredibly intriguing, Moni: I didn’t realize Jeff played piano. Do you recall any of the songs from his set that night? Tears in my eyes reading all the comments. I haven’t listened to Jeff’s music in years and just came across some old stuff. I have been listening to him for days on end now. He was brilliant. I am Rory and was the English pianist running the jam that night and I think it was the second or Third time I had met Jeff and indeed you only had to say one word and he knew exactly who you were it was uncanny! Hope all is well with you, wherever you find yourself these days — and I hope you’re still performing (as I well recall, you set “Whipping Post” alight on that particular evening).